As Herbert Austin first collaborated with E.Y. Wolseley in Australia to develop a sheep-shearing machine, it is fitting that unique Austins were made in Australia. Soon after World War II the Austin Co. purchased the Ruskin Body Works, the sole remaining operation of the former Tarrant group, then being liquidated. 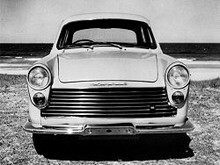 That facility enabled tourer and car-type utility (pick-up) bodies to be built for the popular A40. The B.M.C. amalgamation meant consolidation , in 1957, at the new state of the art plant built on the former Victoria Park racecourse earlier purchased by Lord Nuffield. The first wholly manufactured type was Wolseley 1500-based, the Austin twin being named Lancer. The last car with the Austin name was made in 1974 when the Leyland P76 replaced it in production.